institutes for entrance exam preparation of bank,cat,ias,etc after 12th class but they were only using 20-25% of vedic maths content what was easily available on either net or books easily available , and most importantly they were not using it by the name vedic maths but to promote themselves as experts in coaching field they never used vedic maths or sutras anywhere, that’s why vedic maths remain hidden till now. The difference between the students of 10th class one scoring 50% in maths and other scoring 90% is not that the earlier one doesn’t know the basic concepts of maths or is not hard working but majority of students tend to develop phobia of maths , which begins to develop during 6th class . The reason for phobia in maths is not maths itself. But majorly due to other factors like – 99% people ask the result or numbers in maths from children to know there level , students are judged by the numbers in maths only inspite of 100% result in other subjects . 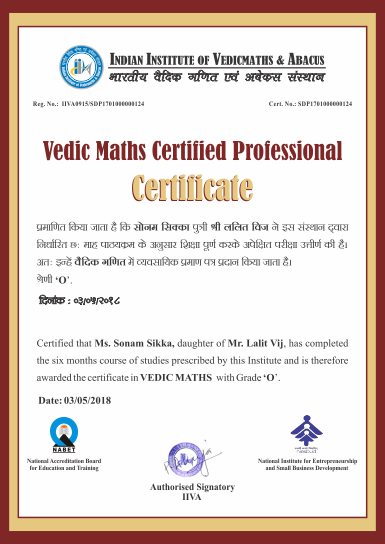 When a student scoring 50% in maths is taught vedic maths and I mean modern vedic maths(with simpler version ) not with Sanskrit sutras which can be more confusing for a student , the students tend to accept that maths can be easy and this helps in accepting the standard maths system also , its playing with the psychology of the child. 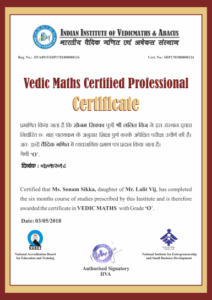 To conclude I will just say the vedic maths is TEACHIN AID it can be used to remove phobia of maths by playing with the psychology of children , NEW PEDAGOGY TO TEACH MATHS not merely with the mindset of teaching them tricks of vedic maths .